Hadrat Abu Bakr is the most respective and eminent personality of Islam. He was the ‘second of the two’ according to the Holy Qur’an. His role was supporting to the Holy Prophet (S.A.W.) and he was the ‘witness of the truth’. He was like a shadow of the Holy Prophet (S.A.W.) in his life-time. He gave strength to Islam after death of Holy Prophet. His reign was very short but he unified Islam and won outstanding victories. He set the pace for making Islam a world force. 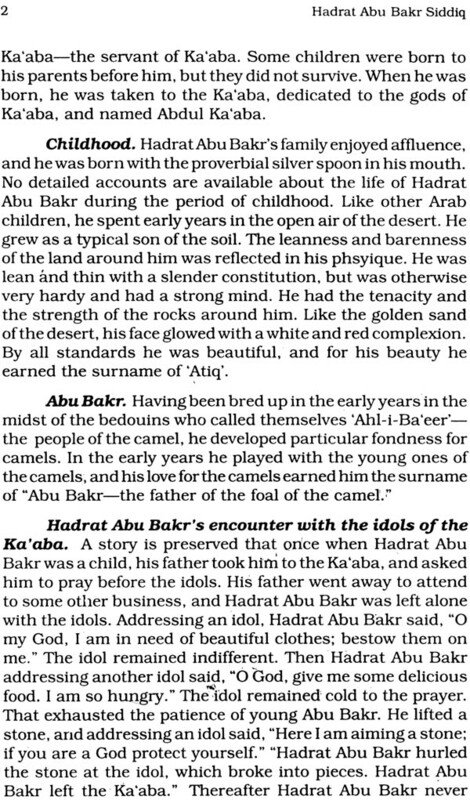 Although Abu Bakr was the outstanding personality of Islam but there have not much been written on him in English. The author has taken great pains in collecting authentic books on him and prepared this biography in comprehensive language. He has tried to present this biography in a scientific way. He analysed the causes responsible for the success of Hadrat Abu Bakr and evaluated the various aspects of his greatness. This book is a framework and the teachers, students and other curious readers can ponder and discover the greatness of Hadrat Abu Bakr. 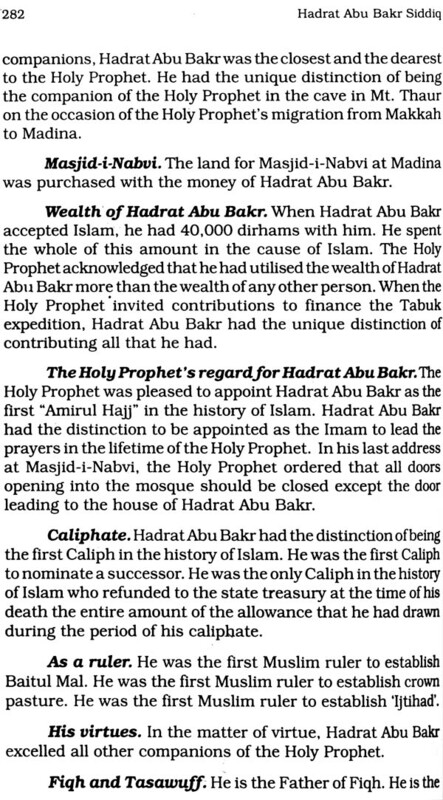 Next to the Holy Prophet, Hadrat Abu Bakr is the most outstanding figure of Islam. 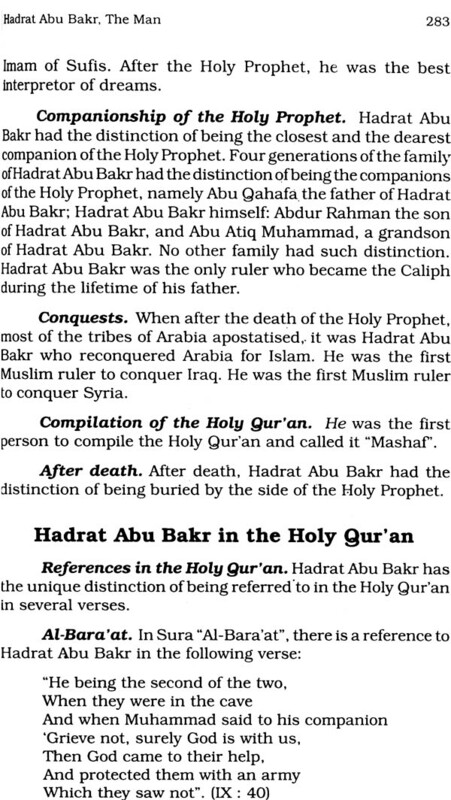 During the life time of the Holy Prophet, Hadrat Abu Bakr was in the words of the Holy Qur’an “the second of the two”. 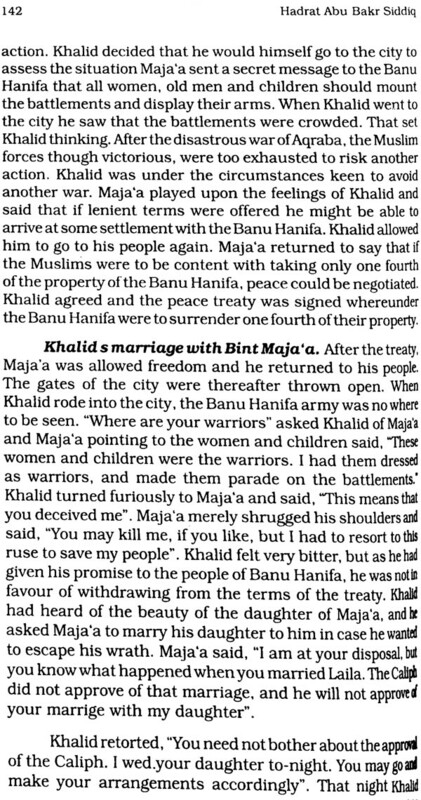 He played a supporting role, and as “witness to the truth” corroborated all that the Holy Prophet” said or did. 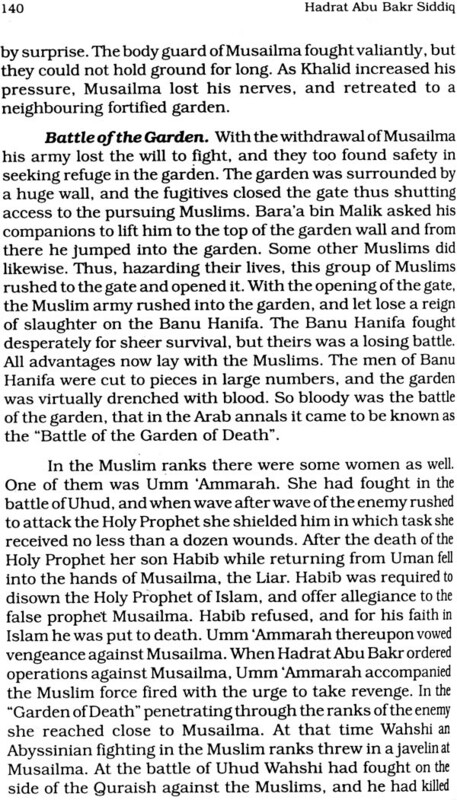 After the death of the Holy Prophet, Hadrat Abu Bakr rose to his full stature of greatness. When he came to office, many crises threatened to overwhelm Islam. Through his dynamic leadership he overcame all such crises. He suppressed apostasy and unified Arabia under Islam. 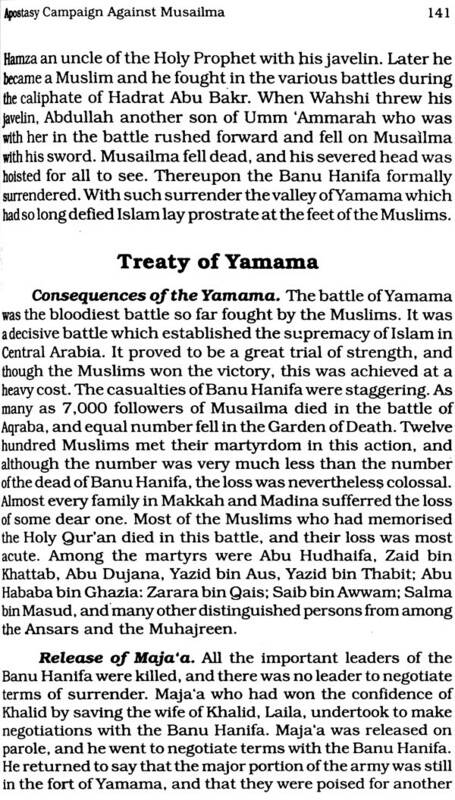 Thereafter the Muslims marched to Iraq and Syria, and won outstanding victories. Hadrat Abu Bakr set the pace for making Islam a world force. 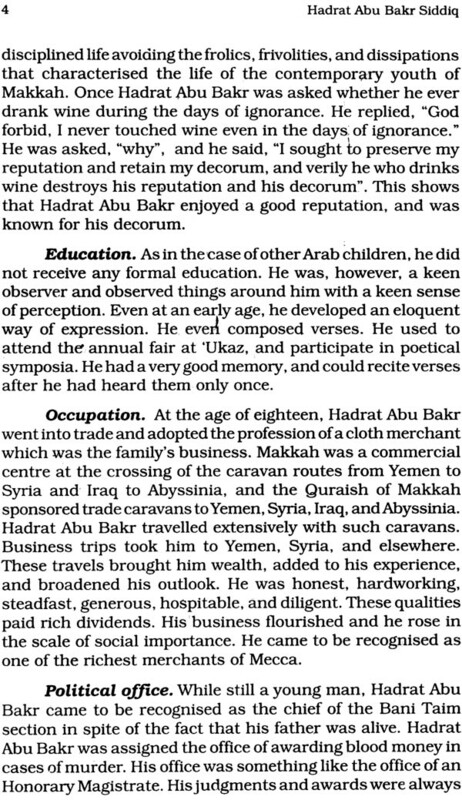 Inspite of the outstanding personality of Hadrat Abu Bakr, it is a matter of some regret that we do not have many books on him. In English there are hardly three or four books about his biography. 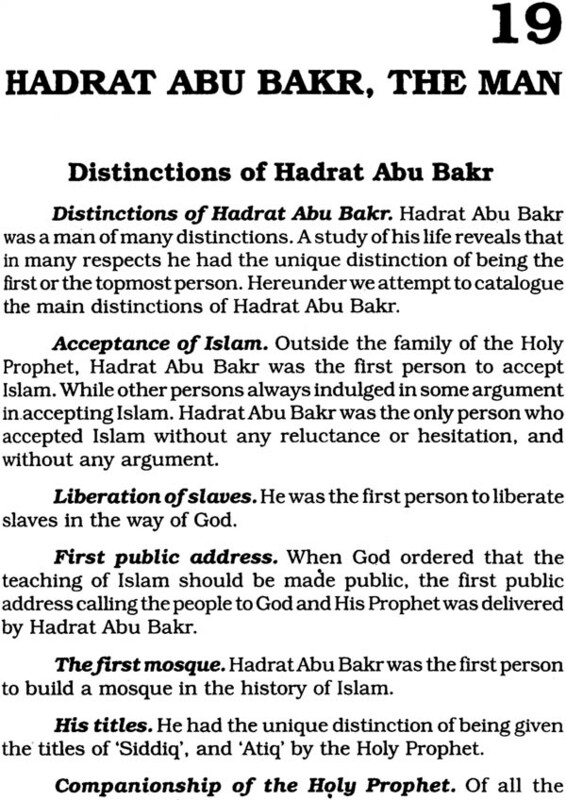 That provides the justification for producing this book on Hadrat Abu Bakr. The book is divided into twenty chapters and about a hundred sections. I am conscious of my limitations, and although I have not been able to make full justice to the greatness of Hadrat Abu Bakr, I have the consolation that profiting from the existing works on the biography of Hadrat Abu Bakr, I have produced a work which is an improvement on the existing works. It will be for the following writers to make further improvements. 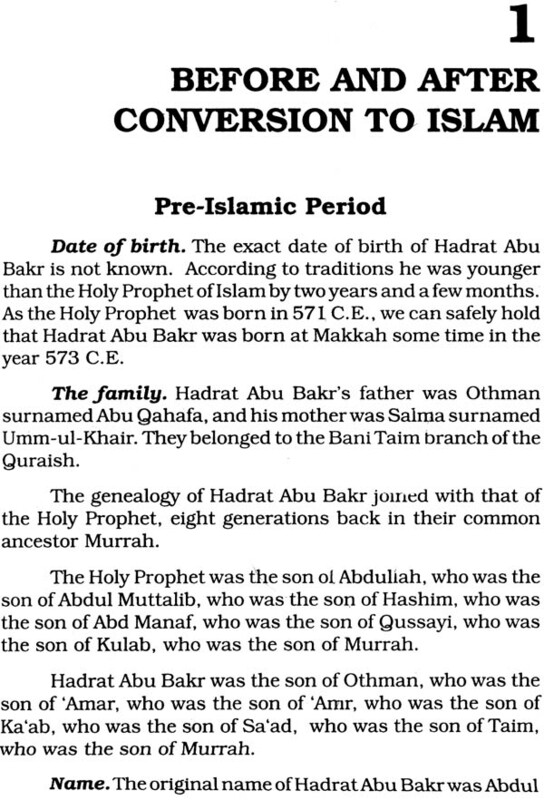 I have tried to present the biography of Hadrat Abu Bakr in a scientific way. I have analysed the causes responsible for the success of Hadrat Abu Bakr. I have made an assessment of the various aspects of the greatness of Hadrat Abu Bakr, His effulgence is too dazzling, and one is apt not to have a full vision. For this disability I seek the indulgence of the readers. I, however, feel that I have provided the framework where under the learned readers can ponder and discover the greatness of Hadrat Abu Bakr for themselves. 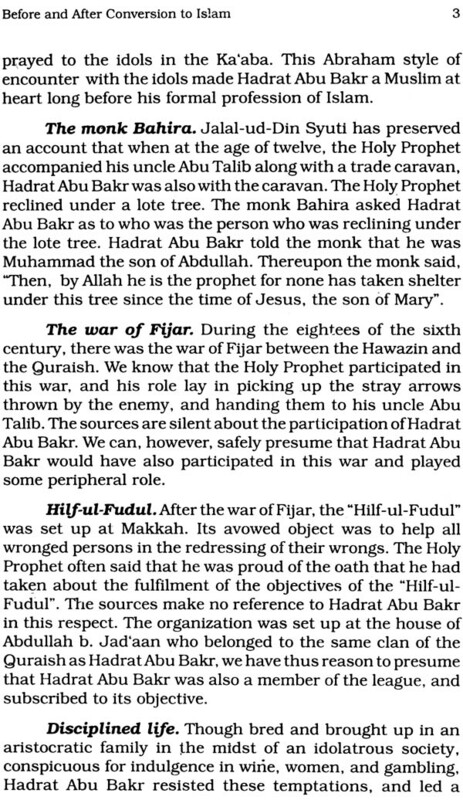 The story of Hadrat Abu Bakr is the story of faith that moved mountains. I am, therefore, sure that a study of his life story will not only inspire the readers, but will fortify their faith as well. May God bless my effort, May God help the readers in having a better understanding of Hadrat Abu Bakr. Before and After Conversion to Islam. The New World of Madina. Conquest of Makkah and After. Successor to the Holy Prophet. 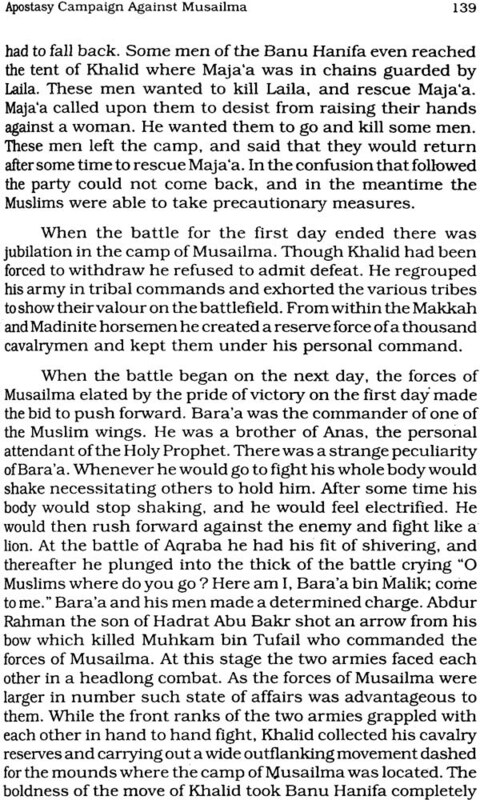 Death of Hadrat Abu Bakr. Hadrat Abu Bakr. The Man. Hadrat Abu Bakr in History.